�Double meanings� in rock art- that�s a surprising idea for many people. Most of the rock art panels that have traditionally been accepted as hunting scenes are actually that, and yet some have a very definite veneer of sacredness attached to them. The ones who did the petroglyphs and pictographs put a second level of intention into their art work, which is often not recognized. Native Americans sometimes say (not entirely in jest) �There are two levels of meaning: one, for the children and the white men, and the second, for those who have been initiated.� It is believed that one must prepare, and become ready to receive sacred knowledge. 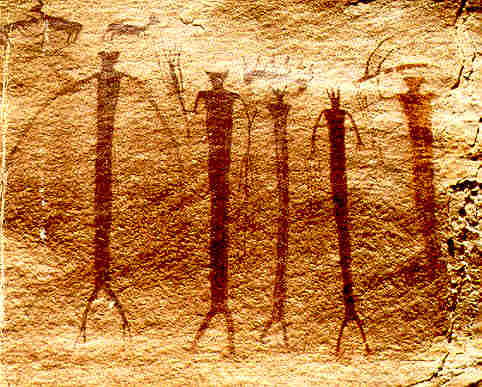 Our first example, a well known panel from near Phoenix, Arizona, shows seven hunters in search of their quarry, a deer. 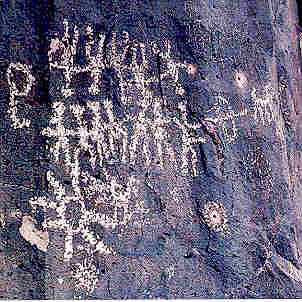 Five are shown upside down, which if taken literally, means that they died on the hunt. One can imagine this as a story told to the young people around campfires. But look closer- there are signs that change the meaning of the panel. The seven men represent seven human epochs of time, and the five upside down men show that five epochs have passed. �Hunting� is another way of saying �seeking� or looking for knowledge from the deer, who is a representation of Elder Brother, the Creator. Another example is shown here of a pictograph in a remote location in the San Rafael Swell. Look closely. A popular hiking book interprets this panel as depicting a deer trap, with one man carrying the prey home over his shoulders. Is this wrong? Others might say that these men are shamans; that one is in the process of ascending to a higher realm, because of the wing-like arms, and that the creatures above them are spirit helpers. Who is right? The probability is high that both ideas are right- that�s the subtle beauty of Native American thinking. There may be even more than just one or two levels of meaning at some complex rock art panels. 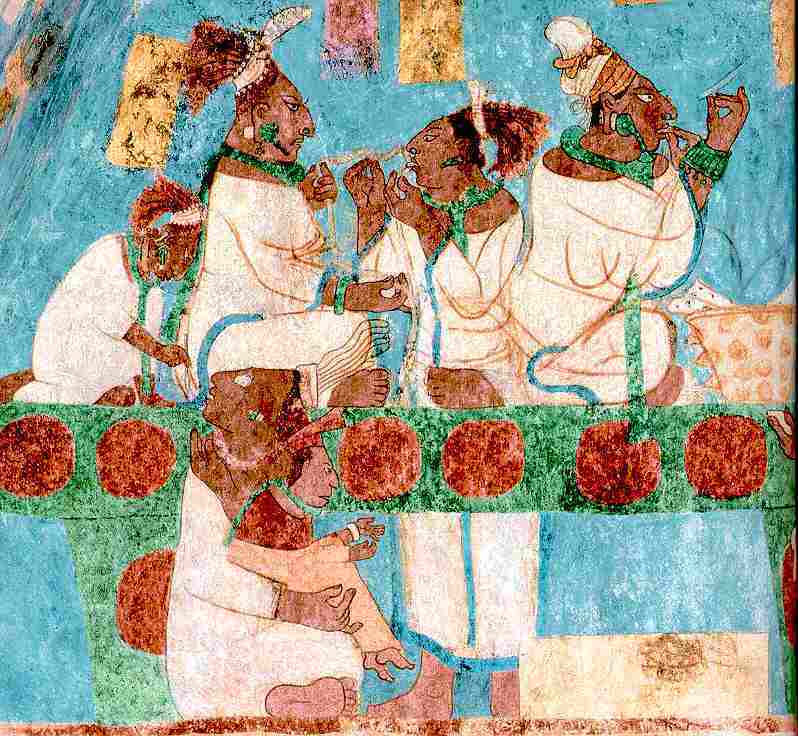 Our third example comes from the beautiful Mayan murals at Bonampak. In the Southwest there�s a very direct tie with Mesoamerica, particularly with the Mayan culture. Once we get a better handle on Mayan concepts, then we will gain better understanding of rock art meanings here. This panel illustrates the pitfalls of interpretation of ancient art when we see through the foggy glasses of our own cultural preconceptions. Look at the first painting, and observe what you will. If you have some prior knowledge of Mayan culture, you will probably realize that this mural depicts Mayan royalty engaging in ritual bloodletting , using stingray spines or pulling a cord through tongue punctures. To the right is the container full of burning blood soaked papers, from which visions may arise. You may even surmise that the small child in the lower left is the new heir to the throne. We cringe at the thought of inflicting such pain upon ourselves. We would agree with the National Geographic writer who interprets the scene as a �poignant rite of passage � as this child �spreads his fingers as if in preparation for his first bloodletting�. Poor little guy, we think. But we are missing something important. Look again, at the close- up. This time, the �double meaning� comes from us! The panel shown is part of a series that presents the new heir to the court and also to the spirits of the ancestors. 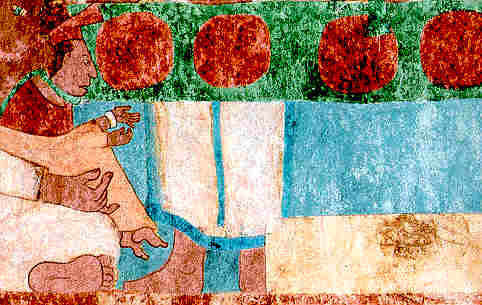 In this panel, the young heir is shown to have the spiritual powers necessary to a royal Mayan leader- the ability to see visions and communicate with spirits. How do we know this? Follow his line of sight. He stares into a rectangular container of sacred cornmeal, where a ghostly apparition is beginning to materialize. His hand gestures have meaning also; his open hand means �to show� or �to reveal� and the other hand displays the sign associated with this ritual . He�s not at all the pitiful victim- instead he is a young king who is displaying his budding ability to communicate with the spirit world. What do YOU think? Do you know any more examples of �double meanings� in rock art? Do you try to see petroglyphs through the eyes of the Ancient Ones?